Phnom Penh (FN), Jan. 22 – At the invitation of the Royal Government of Cambodia, H.E. 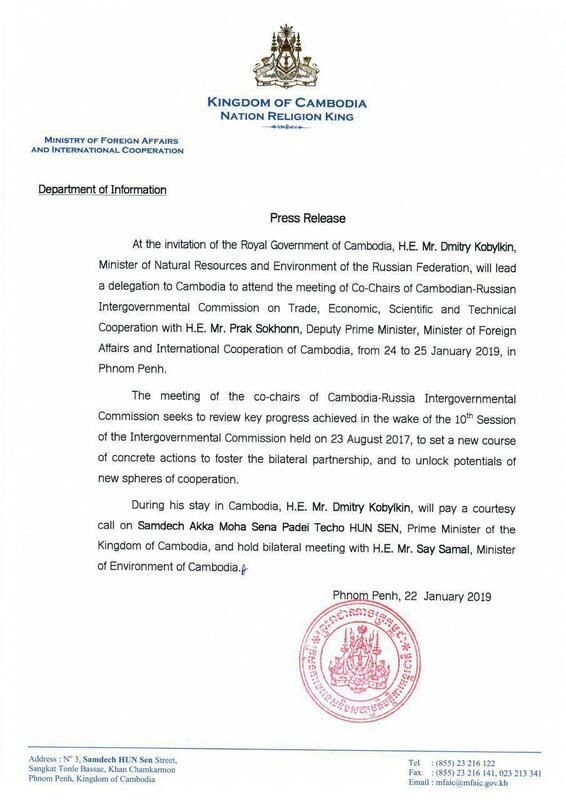 Dmitry Kobylkin, Minister of Natural Resources and Environment of the Russian Federation, will lead a delegation to Cambodia to attend the meeting of Co-Chairs of Cambodian-Russian Intergovernmental Commission on Trade, Economic, Scientific and Technical Cooperation with H.E. Prak Sokhonn, Minister of Foreign Affairs and International Cooperation of Cambodia, from 24 to 25 January 2019, in Phnom Penh, according to the ministry’s press release dated Tuesday. The meeting seeks to review key progress achieved in the wake of the 10th Session of the Intergovernmental Commission held on 23 August 2017, to set a new course of concrete actions to foster the bilateral partnership, and to unlock potentials of new spheres of cooperation, the press release continued. H.E. Dmitry Kobylkin will also pay a courtesy call on Prime Minister Hun Sen of the Kingdom of Cambodia, and hold bilateral meeting with Minister of Environment Say Samal.